I often wonder about my neighbors. When you live in close quarters it's hard not to. I wonder about the girl down the street who keeps her pet bird out on the porch, I once saw her talking and kissing the bird, she waved at me … creepy. I wonder about the guy downstairs who looks 45 but dressed like a 25 year old club kid. I try not to wonder about the guy one building over - who I am sure is a child molester - I keep my dog away from him. 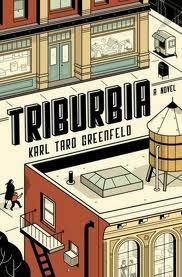 Triburbia is a perfect book for us nosey neighbors. Each chapter title is a different address, each chapter tells the story of the person(s) that live in that address. All are encompassed in Tribeca, a manhattan suburb. Characters do tend to mingle outside of their specific chapters, which makes this novel oh-so-much-fun. Each character is unique and well defined. There are plot lines that run through the stories, but I do not feel that its the main focus. Mainly this novel holds character studies. I adored this novel.